Medium-sized, slow growing, frost tolerant, semi-evergreen or evergreen shrub (H 2-3 m, W 3-4 m). Leaves lanceolate (4-5 cm), leathery, glossy, dark green. Flowers simple, broadly funnel-shaped (1,5-2 cm), light pink to white. Flowering period: July-October. It grows well in light, humus-rich, sufficiently drained, always moderately moist soils, in warm, sheltered, sunny to half-shady sites. 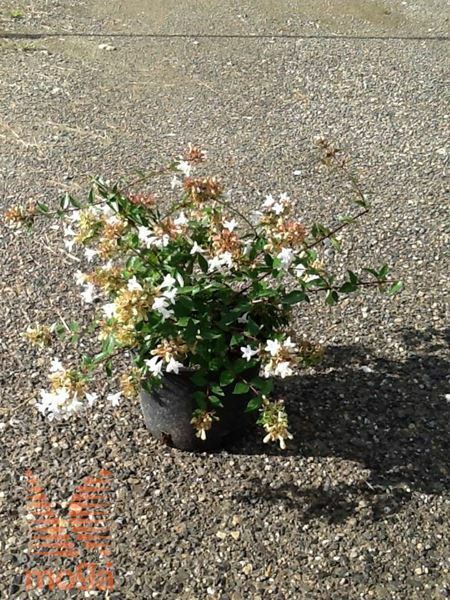 Abelia × grandiflora is a cross between A. chinensis and A. uniflora. Plant can in otherwise appropriate environment survive cold down to - 6 °C.